While uncertainties of some of the atomic transition frequencies have been reduced to the level of 10–8, the molecular transition frequencies are currently diffcult to be measured with the uncertainty below 10–15. This is mainly because of the complicated energy levels of the molecules having the vibrational-rotational states. This paper lists some molecular transition frequencies, which can be measured with the uncertainties lower than 10–16. © Anita Publications. All rights reserved. 1. Hasegawa A, Fukuda K, Kajita M, Ito H, Kumagai M, Hosokawa M, Morikawa T, Metrologia, 41(2004)257-263. 2. Heavner T P, Donley E A, Levi F, Costanzo G, Parker T E, Shirley J H, Ashby N, Barlow S, Jefferts S R, Metrologia, 51 (2005)174-182. 3. Diddams S, Jones D, Ye J, Cundiff S T, Hall J L, Ranka J, Windeler R, Holzwarth R, Udem T, Hänsch T, Phys Rev Lett, 84(2000)5102-5105. 4. Dehmelt H, IEEE Trans Instrum Meas, 31(1982)83-87. 5. Chou C W, Hume D B, Koelemeij J C J, Wineland D J, Rosenband T, Phys Rev Lett, 104(2010) 070802-070806. 6. Huntemann N, Sanner C, Lipphardt B, Tamm Chr, Peik E, Phys Rev Lett, 116(2016)063001-063006. 7. Ushijima I, Takamoto M, Das M, Ohkubo T, Katori H, Nature Photo, 9(2015)185-189. 8. Nicholson T, Cambell S, Hutson R, Marti G, Bloom B, McNally R, Zhang W, Barrett M, Saonova M, Strouse G, Tew W, Ye J, Nature Communications, 6(2015)6896; doi:10.1038/ncomms7896. 9. Rosenband T, Hume D B, Schmidt P O, Chou C W, Brusch A, Lorini L, Oskay W H, Drullinger R E, Fortier T M, Stalnaker J E, Diddams S A , Swan W C, Newbery N R, Itano W M , Wineland D J, Bergquist J C, Science,319(2008)1808-1812. 12. Hong F.-L, Onae A, Jiang J, Guo R, Inaba H, Minoshima K, Schibli T R, Matsumoto H, Nakagawa K, Opt Lett, 28(2003)2324-2326. 13. Shelkovnikov A, Butcher R J, Chardonnet C, Amy-Klein A, Phys Rev Lett, 100(2008)150801; http://dx.doi. org/10.1103/PhysRevLett.100.150801. 14. Weinstein J D, deCarvalho R, Guillet T, Friedrich B, Doyle J M, Nature (London), 395(1998)148-150. 15. Bethlem H L, Berden G, Crompvoets F M H, Jongma R T, van Roij A J A, Meijer G, Nature, 406(2000)491-494. 16. Crompvoets F M H, Bethlem H L, Jongma R T, Meijer G, Nature, 411(2001)174-176. 17. Norrgard E B, McCarron D J, Steinecker M H, Tarbutt M R, DeMille D, Phys Rev Lett, 116(2016)063004, 1-6; doi: 10.1103/PhysRevLett.116.063004. 19. Fioretti A, Amiot C, Dion C M, Dulieu O, Mazzoni M, Smirne G, Gabbanini C, Euro Phys J D, 15(20001)189-198. 20. Ulmanis J, Deiglmayr J, Repp M, Wwester R, Weidemueller M, Chem Rev, 112(2012)4890-4927. 21. Donley E A, Claussen N R, Thomson S T, Wieman C E , Nature (London), 417(2002)529-533. 23. Ni K.–K, Ospelkaus S, de Miranda M H G, Pèer A, Neyenhuis B, Zierbel J J, Kotochigova S, Julienne P S, Jin D S, Ye J, Science, 322(2008)231-235. 24. Koelemeij J C J, Roth B, Wicht A, Ernsting I, Schiller S, Phys Rev Lett, 98(2007)173002, 1-4; doi:10.1103/ PhysRevLett.98.173002. 27. Schneider T, Roth B, Dunker H, Ersting I, Schiller S, Nature Phys, 6(2010)275-278. 28. Schmidt P O, Rosenband T, Langer C, Itano W M, Bergquist J C, Wineland D J, Science, 309(2005)749-752. 31. Kajita M, Abe M, J Phys B: At Mol Opt Phys, 45(2012)185401, 1-5; doi:10.1088/0953-4075/45/18/185401. 32. Khanyile N B, Shu G, Brown K, Nature Communications, 6(2015)7825; doi:10.1038/ncomms8825. 35. Germann M, Tong X, Willitsch S, Nature Phys, 10(2014)820-824. 41. Ivanova M, Stein A, Pashov A, Stolyarov A V, Knoeckel H, Tiemann E, J Chem. Phys, 135(2011)174303, 1-10; doi:10.1063/1.3652755. 44. Kajita M, Gopakumar G, Abe M, Hada M, J Mol Spectrosc, 300 (2014)99-107. While uncertainties of some of the atomic transition frequencies have been reduced to the level of 10–8, the molecular transition frequencies are currently difficult to be measured with the uncertainty below 10–15. This is mainly because of the complicated energy levels of the molecules having the vibrational-rotational states. This paper lists some molecular transition frequencies, which can be measured with the uncertainties lower than 10–16. © Anita Publications. All rights reserved. We investigate oscillation frequencies for simultaneous trapping of more than one type of alkali atoms in a common optical lattice. For this purpose, we present numerical results for “magic” trapping conditions, where the oscillation frequencies for two different kinds of alkali atoms using laser lights in the wavelength range 500-1200 nm are same. These wavelengths will be of immense interest for studying static and dynamic properties of boson-boson, boson-fermion, fermion-fermion, and boson-boson-boson mixtures involving different isotopes of Li, Na, K, Rb, Cs and Fr alkali atoms. In addition to this, we were also able to locate a magic wavelength around 808.1 nm where all the three Li, K, and Rb atoms are found to be suitable for oscillating at the same frequency in a common optical trap. 1. Annual Review of Cold Atoms and Molecules, (eds) K. WMadison, Y. Wang, A. M. Rey, K. Bongs, Vol. 1. (World Scientific Publication), 2013. 2. BlochI , Nature Phys, 1, (2005) 23. 3. Inouye S, J. Goldwin J, Olsen M L, Ticknor C, Bohn J L, Jin D S, Phys. Rev. Lett, 93(2004), 183201. 4. P. P. Orth, D. L. Bergman, and K. L. Hur, Phys. Rev. A 80, 023624 (2009). 5. F. Schreck, L. Khaykovich, K. L. Corwin, G. Ferrari, T. Bourdel, J. Cubizolles, and C. Salomon, Phys. Rev. Lett. 87, 080403 (2001). 6. Z. Hadzibabic, C. A. Stan, K. Dieckmann, S. Gupta, M. W. Zwierlein, A. Gorlitz, and W. Ketterle, Phys. Rev. Lett. 88, 160401 (2002). 7. G. Modugno, G. Roati, F. Riboli, F. Ferlaino, R. J. Brecha, and M. Inguscio, Science 297, 2240 (2002). 8. C. A. Stan, M. W. Zwierlein, C. H. Schunck, S. M. F. Raupach, and W. Ketterle, Phys. Rev. Lett. 93, 143001 (2004). 9. C. Ebner and D. Edwards, Phys. Rep. 2C, 77 (1970). 10. K. Mølmer, Phys. Rev. Lett. 80, 1804 (1998). 11. E.Timmermans and R.Cˆot´e, Phys. Rev. Lett. 80, 3419 (1998). 12. R. Ejnisman, P. Rudy, N. P. Bigelow, P. S. P. Cardona, A. M. Tuboy, D. M. B. P. Milori, V. S. Bagnato, and I. D. Goldman, Braz. J. Phys. 27, 247 (1997). 13. M. S. Safronova, B. Arora, and C. W. Clark, Phys. Rev. A 73, 022505 (2006). 14. B. K. Sahoo and B. Arora, Phys. Rev. A 87, 023402 (2013). 15. B. Arora and B. K. Sahoo, Phys. Rev. A 86, 033416 (2012). 16. U. Dammalapati, K. Harada, and Y. SakemiPhys. Rev. A 93, 043407 (2016). 17. U. Schloder, H. Engler, U. Schunemann, R. Grimm, and M. Weidmuller, Eur. Phys. J. D 7, 331-340 (1999). 18. M.S. Santos, P. Nussenzveig, L.G. Marcassa, K. Helmerson, J. Fleming, S.C. Zilio, and V.S. Bagnato, Phys. Rev. A 52, R4340 (1995). 19. J.P. Shaffer, W. Chapulpczak, and N.P. Bigelow, Phys. Rev. Lett. 82, 1124 (1999). 20. B. K. Sahoo, D. K. Nandy, B. P. Das and Y. Sakemi, Phys. Rev. A 91, 042507 (2015). 21. B. K. Sahoo, Phys. Rev. A 92, 052506 (2015). 22. B. K. Sahoo and B. P. Das, Phys. Rev. A 92, 052511 (2015). 23. Y. Sakemi, K. Harada, T. Hayamizu, M. Itoh, H. Kawamura, S.Liu, H. S. Nataraj, A. Oikawa, M. Saito, T. Sato, H. P. Yoshida,T. Aoki, A. Hatakeyama, T. Murakami, K. Imai, K. Hatanaka,T.Wakasa, Y. Shimizu, and M. Uchida, J. Phys. : Conf. Ser. 302,012051 (2011). 24. E. Gomez, S. Aubin, G. D. Sprouse, L. A. Orozco and D. P. DeMille, Phys. Rev. A 75, 033418 (2007). 25. C. Ekstr¨om, L. Robertsson, and A. Ros´en, PhysicaScripta34, 624 (1986). 26. J. E. Simsarian, W. Z. Zhao, L. A. Orozco, and G. D. Sprouse, Phys. Rev. A 59, 195 (1999). 27. J. E. Simsarian, L. A. Orozco, G. D. Sprouse, and W. Z. Zhao, Phys. Rev. A 57, 2448 (1998). 28. S. Aubin, E. Gomez, L. A. Orozco, and G. D. Sprouse, Phys. Rev. A 70, 042504 (2004). 29. E. Gomez, L. A. Orozco, A. P. Galvan, and G. D. Sprouse, Phys. Rev. A 71, 062504 (2005). Phys. Rev. A 90, 052502 (2014). 31. S. Sanguinetti et al., Opt. Lett. 34, 893 (2009). 32. B. K. Sahoo, T. Aoki, B. P. Das and Y. Sakemi, Phys. Rev. A 93, 032520 (2016). 33. Sahoo B K, J Phys B, 43(2010)085005. 34. Dzuba V A, FlambaumV V, Sushkov O P, Phys Rev A, 51, 3454 (1995). 35. M. Marinescu, D. Vrinceanu, and H. R. Sadeghpour, Phys Rev A, 58, R4259 (1998). 36. M. S. Safronova, W. R. Johnson, and A. Derevianko, Phys Rev A , 60, 4476 (1999). 37. M. S. Safronova and W. R. Johnson, Phys Rev A , 62, 022112 (2000). 38. Mukherjee D, Sahoo B K, Nataraj H S, Das B P, J Phys Chem A, 113(2009)12549. 39. M. Taglieber, A. –C. Voigt, T. Aoki, and K. Dieckmann, Phys Rev Lett, 100, 010401 (2008). 40. B. Arora, D. K. Nandy, and B. K. Sahoo, Phys. Rev. A 85, 012506 (2012). 41. U. Volz and H. Schmoranzer, Phys. Scr. T 65, 48 (1996). 42. R. J. Rafac, C. E. Tanner, A. E. Livingston and H. G. Berry, Phys. Rev. A 60, 3648 (1999). 43. J. Kaur, D. K. Nandy, B. Arora and B. K. Sahoo, Phys. Rev. A 91, 012705 (2015). 44. L.-Y. Tang, Z.-C. Yan, T.-Y. Shi, and J. Mitroy, Phys. Rev. A 81, 042521 (2010). 45. A. J. Thakkar and C. Lupinetti, Chem. Phys. Lett 402, 270 (2005). 46. U. I. Safronova, W. R. Johnson, and M. S. Safronova, Phys. Rev. A 76, 042504 (2007). 47. J. Mitroy and M. W. J. Bromley,Phys. Rev. A 68, 052714 (2003). 48. A. Borschevsky, V. Pershina, E. Eliav, and U. Kaldor, J. Chem. Phys. 138, 124302 (2013). 49. A. Derevianko, W. R. Johnson, M. S. Safronova, and J. F. Babb, Phys. Rev. Lett. 82, 3589 (1999). 50. A. Miffre, M. Jacquey, M. B¨uchner, G. Trenec, and J. Vigue, Eur. Phys. J. D 38, 353 (2006). 51. C. R. Ekstrom, J. Schmiedmayer, M. S. Chapman, T. D. Hammond, and D. E. Pritchard, Phys. Rev. A 51, 3883 (1995). 52. W. F. Holmgren, M. C. Revelle, V. P. A. Lonij, and A. D. Cronin,Phys. Rev. A 81, 053607 (2010). 2CSIR-National Physical Laboratory, Dr. K. S. Krishnan Marg, New Delhi-110012, India. In modern era atomic clocks are the most accurate instruments given by the scientific community which use State-of-the-Art cooling and trapping technologies. Atomic clocks at the optical frequencies are new addition in the last one decade which provide 1s accuracy over the age of the universe. Neutral atoms in optical lattices and single ion in a Paul trap are the two well established techniques for optical frequency standards. In this article we focus on the atomic ions optical frequency standards. Recent worldwide developments, different choice of the species and associated dominant systematics have been discussed in this review. © Anita Publications. All rights reserved. Keywords: Atomic clocks, Frequency standards, Optical frequency standards, Optical lattice, Ion trap, Systematic shifts, Precision measurement. 1. Taylor B N, The International System of Units (SI) (U.S. Government Printing Oce, Gaithersburg, Maryland), 2001. 2. Heavner T P, Donley E A, Levi F, Costanzo G, Parker T E, Shirley J H, Ashby N, Barlow S, Jeerts S R, Metrologia, 51(2014)174-182. 3. Turyshev S G, From Quantum to Cosmos: Fundamental Physics Research in Space, (World Scientic, Singapore), 2009. 4. Morhr P J, Newell D B, Taylor B N, CODATA Recommended Values of the Fundamental Physical Constants: 2014, doi: org/10.5281/zenodo.22826 (2015). 7. Katori H, Ido T, Gonokami M K, J Phys Soc Jpn, 68(1999)2479-2482. 10. Katori H, Takamoto M, Palchikov V G, OvsiannikovV D, Phys Rev Lett, 91(2003)s173005; doi:org/10.1103/PhysRevLett.91.173005. 11. Dehmelt H G, IEEE Trans Instrum Meas, 31(1982)83-87. 12. Takamoto M, Katori H, Phys Rev Lett, 91(2003)223001; doi:org/10.1103/PhysRevLett.91.223001. Ueda K, Katori H, Opt Lett, 34(2009)692; doi:org/10.1364/OL.34.000692. 21. Porsev S G, Derevianko A, Fortson E N, Phys Rev A, 69(2004)021403(R); doi:org/10.1103/PhysRevA.69.021403. 22. Park C Y, Yoon T H, Phys Re A, 68(2003)055401; doi:org/10.1103/PhysRevA.68.055401. 24. Hoyt C W, Barber Z W, Oates C W, Fortier T M, Diddams S A, Hollberg L, Phys Rev Lett, 95(2005)083003; doi: 10.1103/PhysRevLett.95.083003. 25. Kohno T, Yasuda M, Hosaka K, Inaba H, Nakajima Y, Hong F L, Appl Phys Express, 2(2009)072501; doi:org/10.1143/APEX.2.072501. Appl Phys B, 92(2008)501; doi:10.1007/s00340-008-3113-4. 30. Yi L, Mejri S, McFerran J J, Coq Y Le, Bize S, Phys Rev Lett, 106(2011)073005; doi:org/10.1103/PhysRevLett.106.073005. 31. Yamanaka K, Ohmae N, Ushijima I, Takamoto M, Katori H, Phys Rev Lett, 114(2015)230801; doi: 10.1103/PhysRevLett.114.230801. 32. De S, Batra N, Chakraborty S, Panja S, Sen Gupta A, Curr Sci, 106(2014)1348-1352. 33. Wineland D J, Dehmelt H, Bull Am Phys Soc, 20(1975)637. 34. Hänsch T W, Schawlow A L, Opt Comm, 13(1975)68-69. 38. Wineland D J, Itano W M, Phys Lett A, 82(1981)75-78. 40. Paul W, Raether M, Z Physik 140(1955)262; doi:10.1007/BF01328923. 41. Raizen M G, Gilligan J M, Bergquist J C, Itano W M, Wineland D J, Phys Rev A, 45(1992)6493; doi:org/10.1103/PhysRevA.45.6493. 43. Schrama C A, Peik E, Smith W W, Walther H, Opt Comm, 101(1993)32-36. 44. Dehmelt H G, Toschek P, Bull Am Phys Soc ,, 20(1975)61; https://arxiv.org/pdf/1407.3493.pdf. 45. Dehmelt H G, Walther H, Bull Am Phys Soc, 20(1975)61; https://arxiv.org/pdf/1407.3493.pdf. 46. Chou C W, Hume D B, Koelemeij J C J, Wineland D J, Rosenband T, Phys Rev Lett, 104(2010)070802; doi: org/10.1103/PhysRevLett.104.070802. Swann W C, Newbury N R, Itano W M, Wineland D J, Bergquist J C, Science, 319(2008)1808-1812. 48. Larson D J, Bergquist J C, Bollinger J J, Itano W M, Wineland D J, Phys Rev Lett, 57(1986)70; doi:org/10.1103/PhysRevLett.57.70. 49. Wubbena J B, Amairi S, Mandel O, Schmidt P O, Phys Rev A, 85(2012)043412; doi:org/10.1103/PhysRevA.85.043412. 50. Cirac J I, Zoller P, Phys Rev Lett, 74 (1995)4091; doi:org/10.1103/PhysRevLett.74.4091. Rovera G D, Laurent Ph, Phys Rev Lett, 102(2009)023002; doi:org/10.1103/PhysRevLett.102.023002. 53. Guan H, Huang Y, Liu Pei-Liang, Bian W, Shao H, Gao Ke-Lin, Chinese Physics B, 24(2015)0542131-05421314. 57. Matsubara K, Hayasaka K, Li Y, Ito H, Nagano S, Kajita M, Hosokawa M, Appl Phys Express, 1 (2008)067011; doi: org/10.1143/APEX.1.067011. 60. Champenois C, Houssin M, Lisowski C, Knoop M, G. Hagel G, M. Vedel, Vedel F, Phys Lett A, 331(2004)298; doi:org/10.1016/j.physleta.2004.09.008. 61. Boshier M G, Barwood G P, Huang G, Klein H A, Appl Phys B, 71(2000)51-56. 66. Zanthier J V, Eichenseer M, Nevsky A Yu, Okhapkin M, Schwedes Ch, Walther H, Laser Phys, 15(2005)1021-1027. 67. Peik E, Hollemann G, Walther H, Phys Rev A, 49(1994)402; doi.org/10.1103/PhysRevA.49.402. 70. Pyka K, Herschbach N, Keller J, Mehlstaübler T E, Appl Phys B, 114(2014)231; doi: 10.1007/s00340-013-5580-5. (2007) Joint with the 21st European Frequency and Time Forum. IEEE International; doi: 10.1109/FREQ.2007.4319107. 73. Ramsey N F, Molecular Beams, (Oxford Univ. Press, London), 1956. 76. Yu N, Zhao X, Dehmelt H, Nagourney W, Phys Rev A, 50(1994)2738; doi:org/10.1103/PhysRevA.50.2738. 83. Whitford B G, Siemsen K J, Madej A, Sankey J D, Opt Lett, 19(1994)356-358. 86. Huntemann N, Okhapkin M, Lipphardt B, Weyers S, Tamm Chr, Peik E, Phys Rev Lett, 108(2012)090801; doi: org/10.1103/PhysRevLett.108.090801. 87. Huntemann N, Sanner B, Lipphardt B, Tamm Chr, Peik E, Phys Rev Lett, 116(2016)063011;doi: 10.1103/PhysRevLett.116.063001. 88. Hinkley N, Sherman J A, Phillips N B, Schioppo M, Lemke N D, Beloy K, Pizzocaro M, Oates C W, Ludlow A D, Science, 341(2013)1215-1218. 90. Arnold K, Hajiyev E, Paez E, Lee C H, Barret M D, Bollinger J, Phys Rev A, 92(2015)032108; doi: 10.1103/PhysRevA.92.032108. 91. Paez E, Arnold K J, Hajiyez E, Barrett M D, Phys Rev A, 93(2016)042112; doi: 10.1103/PhysRevA.93.042112. 92. Arin B S, Lutetium Ion Spectroscopy, Thesis, National University of Singapore, (2014). 93. Barrett M D (private communication). 97. Itano W M, J Res Natl Inst Stand Technol, 105(2000)829-837. 98. Berkeland D J, Miller J D, Bergquist J C, Itano W M, Wineland D J, J Appl Phys, 83(1998)10; doi:org/10.1063/1.367318. Levi F, Parker T E, Shirley J, Appl Phys B, 167(2007)89; doi:10.1007/s00340-007-2762-z. Nuñez Portela M, Onderwater C J G, Santra B, Timmermans R G E, Wansbeek L W, Willmann L, Wilschut H W, Phys Lett A, 375(2011)3130-3134. Santra B, Shidling P D, Timmermans R G E, Willmann L, Wilschut H W, Phys Rev A, 82(R) (2010)010501(R); doi.org/10.1103/PhysRevA.82.010501. 104. Dzuba V A, Flambaum V V, Phys Rev A, 61(2000)034502; doi:org/10.1103/PhysRevA.61.034502. Santra B, Shidling P D, Timmermans R G E, Willmann L, Wilschut H W, Hyperfine Interact, 9(2011)199; doi:10.1007/s10751-011-0296-6. Versolato O O, Willmann L, Wilschut H W, Jungmann K, Appl Phys B, 114(2014)173-182; doi: 10.1007/s00340-013-5603-2. 109. Riehle F, Frequency Standards: Basics and Applications, (Wiley-VCH Verlag GmbH Co. KGaA), 2004. 111. Sobelman I I , Atomic Spectra and Radiative Transitions, (Springer-Verlag, Berlin), 1979. 112. Edmonds A R, Angular Momentum in Quantum Mechanics, (Princeton Univ. Press, New Jersey), 1974. 113. 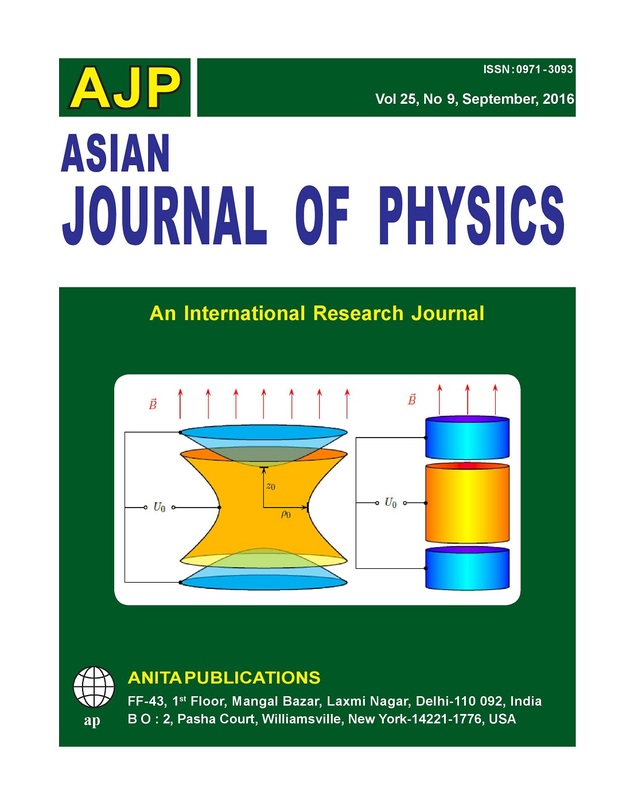 Batra N, Sahoo B K, De S, Chinese Phys B, 25(2016)113703; doi:org/10.1088/1674-1056/25/11/113703. 117. Chou C W, Hume D B, Rosenband T, Wineland D J, Science, 329(2010)1630-1633. Takamoto M, Hong F.-L, Katori H, Flambaum V V, Phys Rev Lett, 100(2008)140801; doi: org/10.1103/PhysRevLett.100.140801. 120. Wolf P, Bordé Ch J, Clairon A, Duchayne L, Landragin A, Lemonde P, Santarelli G, Ertmer W, Rasel E, Cataliotti F S, Inguscio M, Tino G M, Gill P, Klein H, Reynaud S, Salomon C, Peik E, Bertolami O, Gil P, Páramos J, Jentsch C, Johann U, Rathke A, Bouyer P, Cacciapuoti L, Izzo D, Natale P De, Christophe B, Touboul P, Turyshev S G, Anderson J, Tobar M E, Schmidt-Kaler F, Vigué J, Madej A A, Marmet L, Angonin M.-C, Delva P, Tourrenc P, Metris G, Müller H, Walsworth R, Lu Z H, Wang L J, Bongs K, Toncelli A, Tonelli M, Dittus H, Lämmerzahl C, Galzerano G, Laporta P, Laskar J, Fienga A, Roques F, Sengstock K, Exp Astron, 23(2009)551-687. Ye J, Nat Comm, 6(2015)6896; doi: 10.1038/ncomms/7896. 135. Akamatsu D, Yasuda M, Inaba H, Hosaka K, Tanabe T, Onae A, Hong F, Opt Express, 22(2014)7898-7905. Electromagnetic Measurements (CPEM 2014), Rio de Janeiro, 2014, p. 668. 140. Wang Y H, Liu T, Dumke R, Stejskal A, Zhao Y N, Zhang J, Lu Z H, Wang L J, Becker Th, Walther H, Laser Phys, 17(2007)1017-1024. 142. Tommaseo G, Pfeil T, Revalde G, Werth G, Indelicato P, Desclaux J P, Eur Phys Journal: D, 25(2003)113-121. 143. Roos C F, Chwalla M, Kim K, Riebe M, Blatt R, Nature, 443(2006)316-319. 144. Barwood G P, Gill P, Huang G, Klein H A, in Conference on Precision Electromagnetic Measurements (CPEM 2012), Washington DC, 2012, p. 270. 145. Jiang D, Arora B, Safronova M S, Clark C W, J Phys B, 42(2009)154020; doi: org/10.1088/0953-4075/42/15/154020. 147. Meggers W F, Res J Natl Bur Stand, 71A(1967)396-544. 8. McKeever J, Buck J R, Boozer A D, Kuzmich A, Nagerl H C, Kurn D M S, Kimble H J, Phys Rev Lett, 90(2003)133602; doi.org/10.1103/PhysRevLett.90.133602. 13. Ludlow A D, Boyd M M, Zelevinsky T, Foreman S M, Blatt S, Notcutt M, Ido T, Ye J, Phys Rev Lett, 96, (2006)033003; doi: 10.1103/PhysRevLett.96.033003. 14. Baillard X, Fouche M, Targat R Le, Westergaard P G, Lecallier A, Coq Y Le, Rovera G D, Bize S, Lemonde P, Opt Lett, 32(2007)1812; doi:org/10.1364/OL.32.001812. 19. Hong F-L, Musha M, Takamoto M, Inaba H, Yanagimachi S, Takamizawa A, Watabe K, Ikegami T, Imae M, Fujii Y, Amemiya M, Nakagawa K, Ueda K, Katori H, Opt Lett, 34(2009)692; doi:org/10.1364/OL.34.000692. 23. Maruyama R, Wynar R H, Romalis M V, Andalkar A, Swallow M D, Pearson C E, Fortson E N, Phys Rev A, 68(2003)011403; doi:org/10.1103/PhysRevA.68.011403 . 26. Nevsky A Y, Bressel U, Ernsting I, Eisele C, Okhapkin M, Schiller S, Gubenko A, Livshits D, Mikhrin S, Krestnikov I, Kovsh A, Appl Phys B, 92(2008)501; doi:10.1007/s00340-008-3113-4. 47. Rosenband T, Hume D B, Schmidt P O, Chou C W, Brusch A, Lorini L, Oskay W H, Drullinger R E, Fortier T M, Stalnaker J E, Diddams S A, Swann W C, Newbury N R, Itano W M, Wineland D J, Bergquist J C, Science, 319(2008)1808-1812. 52. Chwalla M, Benhelm J, Kim K, Kirchmair G, Monz T, Riebe M, Schindler P, Villar A S, Hänsel W, Roos C F, Blatt R, Abgrall M, Santarelli G, Rovera G D, Laurent Ph, Phys Rev Lett, 102(2009)023002; doi:org/10.1103/PhysRevLett.102.023002. 56. Matsubara K, Hachisu H, Li Y, Nagano S, Locke C, Nogami A, Kajita M, Hayasaka K, Ido T, Hosokawa M, Opt Express, 20(2012)22034; doi: 10.1364/OE.20.022034. 71. Li Y, Ohtsubo N, Matsubara K, Nagano S, Hayasaka K, in Conference on Precision Electromagnetic Measurements (CPEM 2014), Rio de Janeiro, 2014, p 60. 72. Liu T, Wang Y H, Elman V, Stejskal A, Zhao Y N, Zhang J, Lu Z H, Wang L J, Dumke R, Becker Th, Walther H,Frequency Control Symposium, (2007) Joint with the 21st European Frequency and Time Forum. IEEE International; doi: 10.1109/FREQ.2007.4319107. 84. Tamm C, Huntemann N, Lipphardt B, Gerginov V, Nemitz N, Kazda M, Weyers S, Peik E, Phys Rev A, 89(2014)023820; doi:org/10.1103/PhysRevA.89.023820. 85. King S A, Godun R M, Webster S A, Margolis H S, Johnson L A M, Szymaniec K, Baird P E G, Gill P, New J Phys, 14(2012)013045; doi:org/10.1088/1367-2630/14/1/013045. 99. Stalnaker J E, Diddams S A, Fortier T M, Kim K, Hollberg L, Bergquist J C, Itano W M, Delany M J, Lorini L, Oskay W H, Heavner T P, Jeerts S R, Levi F, Parker T E, Shirley J, Appl Phys B, 167(2007)89; doi:10.1007/s00340-007-2762-z. 101. Versolato O O, Giri G S, van den Berg J E, Böll O, Dammalapati U, van der Hoek D J, Hoekstra S, Jungmann K, Kruithof W L, Müller S, Nuñez Portela M, Onderwater C J G, Santra B, Timmermans R G E, Wansbeek L W, Willmann L, Wilschut H W, Phys Lett A, 375(2011)3130-3134. 102. Versolato O O, Giri G S, Wansbeek L W, van den Berg J E, van der Hoek D J, Jungmann K, Kruithof W L, Onderwater C J G, Sahoo B K, Santra B, Shidling P D, Timmermans R G E, Willmann L, Wilschut H W, Phys Rev A, 82(R) (2010)010501(R); doi.org/10.1103/PhysRevA.82.010501. 105. Versolato O O, Wansbeek L W, Giri G S et al, Berg J E van den, Hoek D J van der, Jungmann K, Kruithof W L, Onderwater L C J G, Sahoo, B K, Santra B, Shidling P D, Timmermans R G E, Willmann L, Wilschut H W, Hyperfine Interact, 9(2011)199; doi:10.1007/s10751-011-0296-6. 107. Portela M N, Dijck E A, Mohanty A, Bekker H, van den Berg J E, Giri G S, S. Hoekstra S, Onderwater C J G, Schlesser S, Timmermans R G E, Versolato O O, Willmann L, Wilschut H W, Jungmann K, Appl Phys B, 114(2014)173-182; doi: 10.1007/s00340-013-5603-2. 119. Blatt S, Ludlow A D, Campbell G K, Thomsen J W, Zelevinsky T, Boyd M M, Ye J, Baillard X, Fouché M, Targat R Le, Brusch A, Lemonde P, Takamoto M, Hong F.-L, Katori H, Flambaum V V, Phys Rev Lett, 100(2008)140801; doi: org/10.1103/PhysRevLett.100.140801. 128. Nicholson T L, Campbell S L, Hutson R B, Marti G E, Bloom B J, McNally R L, Zhang W, Barrett M D, Safronova M S, Strouse G F, Tew W L, Ye J, Nat Comm, 6(2015)6896; doi: 10.1038/ncomms/7896. 131. Hachisu H, Fujieda M, Nagano S, Gotoh T, Nogami A, Ido T, Falke St, Huntemann N, Grebing C, Lipphardt B, Lisdat Ch, Piester D, Opt Lett, 39(2014)4072-4075. 132. Akamatsu D, Inaba H, Hosaka K, Yasuda M, Onae T, Suzuyama T, Amemiya M, Hong F, Appl Phys Express, 7 (2014)012401; doi.org/10.7567/APEX.7.012401. 133. Katori H in OSA Technical Digest (online) of Conference on Lasers and Electro-Optics, (CLEO 2015), San Jose, 2015, Optical Society of America, paper SF1L.1. We use the technique of chopped nonlinear magneto-optic rotation (NMOR) at room temperature in 133Cs vapor cell to measure the permanent electric dipole moment (EDM) in the atom. The cell has paraffin coating on the walls to increase the relaxation time. The signature of the EDM is a shift in the Larmor precession frequency which is correlated with the application of an E field. We analyze errors in the technique, and show that the main source of systematic error is the appearance of a longitudinal B field when the E field is applied. This error can be eliminated by doing measurements on the two ground hyperfine levels. Using an E field of 2.6 kV/cm, we place an upper limit on the electron EDM of 2.9´10–22 e-cm (95% condence). This limit can be increased by 7 orders-of-magnitude|and brought below the current best experimental value|with easily implementable improvements to the technique. © Anita Publications. All rights reserved. Keywords: NMOR; EDM; Paraffin coating. 1. Chou C W, D B Hume, Koelemeij J C J, Wineland D J, and Rosenband T, Phys. Rev. Lett. 104(2010) 070802. 2. Hinkley N, Sherman J A, Phillips N B, Schioppo M, Lemke N D, Beloy K, Pizzocaro M, Oates C W, Lud-low A D, Science 341(2013) 1215. 3. Bloom B J, Nicholson T L, Williams J R, Campbell S L, Bishof M, Zhang X, Zhang W, Bromley S L, Ye J, Nature (London) 506(2014) 71. 4. Ushijima I, Takamoto M, Das M, Ohkubo T, and Katori H, Nature Photonics 9(2015) 185. 5. Campbell C J, Radnaev A G, Kuzmich A, Dzuba V A, Flambaum V V, and Derevianko A, Phys. Rev. Lett. 108(2012) 120802. 6. Derevianko A, Dzuba V A, Flambaum V V, Phys. Rev. Lett. 109(2012) 180801. 7. Yudin V I, Taichenachev A V, and Derevianko A, Phys. Rev. Lett. 113(2014) 233003. 8. Berengut J C, Dzuba V A, Flambaum V V, and Ong A, Phys. Rev. A 86(2012) 022517. 9. Berengut J C, Dzuba V A, and Flambaum V V, Phys. Rev. Lett. 105(2010) 120801. 10. Berengut J C, Dzuba V A, Flambaum V V, and Ong A, Phys. Rev. Lett. 106(2011) 210802. 11. Berengut J C, Dzuba V A, and Flambaum V V, Phys. Rev. A 84(2011) 054501. 12. Berengut J C, Dzuba V A, Flambaum V V, and Ong A, Phys. Rev. Lett. 109(2012) 070802. 13. Berengut J C, Dzuba V A, and Flambaum V V, Phys. Rev. A 86(2012) 054501. 14. Dzuba V A, Flambaum V V, and Katori H, Phys. Rev. A 91(2015) 022119. 15. Dzuba V A , Derevianko A, and Flambaum V V, Phys. Rev. A 86(2012) 054501. 16. Safronova M S, Dzuba V A, Flambaum V V, Safronova U I, Porsev S G, and Kozlov M G, Phys. Rev. Lett. 113(2014) 030801. 17. Safronova M S, Dzuba V A, Flambaum V V, Safronova U I, Porsev S G, and Kozlov M G, Phys. Rev. A 90(2014) 042513. 18. Safronova M S, Dzuba V A, Flambaum V V, Safronova U I, Porsev S G, and Kozlov M G, Phys. Rev. A 90(2014) 052509. 19. Windberger A, Crespo L´opez-Urrutia J R, Bekker H, Oreshkina N S, Berengut J C, Bock V, Borschevsky A, Dzuba V A, Eliav E, Harman Z, Kaldor U, Kaul S, Safronova U I, Flambaum V V, Keitel C H, Schmidt P O, Ullrich J, and Versolato O O, Phys. Rev. Lett. 114(2015) 150801. 20. DIRAC, a relativistic ab initio electronic structure pro-gram, Release DIRAC14 (2014), written by Visscher L, Jensen H J Aa, Bast R, Saue T, with contributions from Bakken V, Dyall K G, Dubillard S, Ekstr¨om U, Eliav E, Enevoldsen T, Faßhauer E, Fleig T, Fossgaard O, Gomes A S P, Helgaker T, Lærdahl J K, Lee Y S, Henriksson J, Iliaˇs M, Jacob Ch R, Knecht S, Ko-morovsk´y S, Kullie O, Larsen C V, H. Nataraj S, Nor-man P, Olejniczak G, Olsen J, Park Y C, Pedersen J K, Pernpointner M, Ruud K, Salek P, Schimmelpfennig B, Sikkema J, Thorvaldsen A J, Thyssen J, Van Stralen J, Villaume S, Visser O, Winther T, and Yamamoto S (see http://www.diracprogram.org). 21. Dyall K G, J. Phys. Chem. A 113(2009) 12638; Theor. Chem. Acc. 117(2007) 483; Theor. Chem. Acc. 112(2004) 403; Theor. Chem. Acc. 125(2009) 97; Theor. Chem. Acc. 129(2011) 603; Gomes A S P, Dyall K G and Visscher L, Theor. Chem. Acc. 127(2010) 369. Available from the Dirac web site, http://dirac.chem.sdu.dk. The magnetic moments of electrons, generally expressed by the dimensionless g-factorg = ΔE/μB BΔm as scaling factor for the energy difference ΔE between Zeeman levels of quantum number m in a magnetic field B is an important quantity for our understanding of atomic structure. Penning traps are the instruments of choice to measure values of g for charged particles. We review results of measurements performed in recent years onmulti-electron ions which serve as test of atomic structure calculations. Very precise results have been obtained on hydrogen- andlithium-like ions which represent to date the most stringent test of Quantum Electrodynamic calculations in bound systems. From a combination of experimental and theoretical results we derived a new value for the electron's atomic mass, improving the number listed in the tables of fundamental constants by more than one order of magnitude.© Anita Publications. All rights reserved. 1. Kusch P and Foley H M, Phys Rev, 72 (1947) 1256. 10. Indelicato P, A.-M MÅrtensson-Pendrill A.-M, Quint W, Desclaux J.-P, Hyperfine Interactions, 146/147(2003)127-131. 21. Sturm S, Blaum K, Werth G, Ann Phys, 525(2013)620. 22. Diederich M et al., Hyperfine Interactions, 115(1998)185. 32. Sturm S, Köhler F, Zatorski J, Wagner A, Harman Z, Werth G, Quint W, C H Keitel, Blaum K, Nature, 506 (2014) 467-470. Recent progress on computational methods for high precision calculations of three-electron atomic systems are reviewed. We first introduce two important methods for solving the time independent Schrödinger equation, the Rayleigh-Ritz variational method and Rayleigh-Schrödinger perturbation method. We then show how to construct a nonrelativistic wave function variationally in Hylleraas coordinates and how to solve the eigenvalue problems of the Hamiltonian for a three-electron atomic system. We then focus on computational aspects of relativistic and quantum electrodynamic corrections to atomic energy levels. Some theoretical results for nonrelativistic energy eigenvalues, ionization energies, fine structure splittings, and isotope shifts are reviewed. Finally, we include two special sections that describe, respectively, basic mathematical properties of Schrödinger operators and mathematical theory of the Fromm-Hill integral. © Anita Publications. All rights reserved. 1. Lamb W E and Retherford R C, Phys Rev, 72(1947)241. 2. Grant I P, in Handbook of Atomic, Molecular, and Optical Physics, edited by Drake G W (Springer Science+Business Media, Inc.) 2006, p325. 4. King F W, J Mole Struct (Theochem), 400(1997)7-56. (b) Hylleraas E A, Z. Phys. 54 (1929) 347. 6. Drake G W F, Cassar M M, and Nistor R A, Phys Rev A, 65 (2002) 054501. 7. Korobov V I, Phys Rev A, 66 (2002) 024501. 8. Schwartz C, Int. J. Mod. Phys. E 15 (2006) 877; arXiv: math-ph/0605018. 12. Perkins J F, J Chem Phys, 48 (1968) 1985. 13. King F W, Phys Rev A, 40 (1989) 1735. 14. King F W, Phys Rev A, 43 (1991) 3285; 58 (1998) 3597. 15. Drake G W F, Yan Z-C, Phys Rev A, 52 (1995) 3681. 16. Yan Z-C, Drake G W F, Phys Rev A, 52 (1995) 3711. 17. Yan Z-C and Drake G W F, J. Phys. B 30 (1997) 4723; 33 (2000) 2437. 22. Bushaw B A, Nortershauser W, Drake G W F, and Kluge H-J, Phys Rev A, 75 (2007)052503. 23. Stanke M, Komasa J, Kedziera D, Bubin S, and Adamowicz L, Phys Rev A, 77 (2008)062509. 24. Sharkey K L, Bubin S, and Adamowicz L, Phys Rev A, 83 (2011) 012506. 25. Bubin S, and Adamowicz L, J Chem Phys, 136(2012)134305. 26. Sims J S and Hagstrom S A, Phys Rev A, 83 (2011) 032518. 27. Stanke M, Komasa J, Bubin S, Adamowicz L, Phys Rev A, 80 (2009) 022514. 28. Puchalski M, Komasa J, Pachucki K, Phys Rev A, 92 (2015) 062501. 29. Puchalski M and Pachucki K, Phys. Rev. Lett. 113 (2014) 073004. 30. Puchalski M, Pachucki K, Phys Rev A, 92 (2015) 012513. 31. Puchalski M, Pachucki K, Phys Rev A, 80 (2009) 032521. 32. Puchalski M, Pachucki K, Phys Rev A, 81(2010)052505. 33. Breit G, Phys. Rev. 34 (1929) 553; 39(1932)616. 34. Stone A P, Proc. Phys. Soc. (London) 77 (1961) 786; 81 (1963) 868. 35. Douglas M, Kroll N M, Annals of Physics 82 (1974) 89. 36. Araki H, Prog. Theor Phys,17 (1957) 619. 37. Sucher J, Phys. Rev. 109 (1958) 1010. 38. Zhang T, Drake G W F, Phys Rev A, 54 (1996) 4882. 39. Caswell W E, Lepage G P, Phys Lett B, 167 (1986) 437. 40. Pachucki K, Phys Rev A, 56 (1997) 297. (b) Pachucki K, J Phys B, 32(1999)137. 42. Pachucki K, Phys Rev A, 71(2005)012503. 43. Pachucki K, Phys. Rev. Lett. 97 (2006) 013002. 44. Pelzl P J, Smethells G J, and King F W, Phys. Rev. E, 65 (2002) 036707. 45. Yan Z-C and Drake G W F, Can. J. Phys, 72 (1994) 822. 46. Pachucki K, Puchalski M, Phys Rev A, 71 (2005) 032514. 47. King F W, Adv. At. Mol. Opt. Phys, 40 (1999) 57. 48. Fromm D M, Hill R N, Phys Rev A, 36(1987) 1013. 49. Drake G W F, in Encyclopedia of Applied Physics, Vol. 23 (WILEY-VCH Verlag GmbH) 1998, p121. 50. Hylleraas E A, Undheim B, Z. Phys. 65 (1930) 759. 51. MacDonald J K L, Phys. Rev. 43 (1933) 830. 52. Dalgarno A and Stewart A L, Proc. R. Soc. A 238 (1956) 269. 53. Drake G W F, Nucl. Instrum. Methods Phys. Res. B 31 (1988) 7. 54. McKenzie D K and Drake G W F, Phys Rev, 44 (1991) R6973; 48 (1993) 4803(E). 55. Mitroy J et al., Rev. Mod. Phys. 85 (2013) 693. 56. Kato T, Commun. Pure Appl. Math. 10 (1957) 151. 57. Drake G W F, Nortershauser W, and Yan Z-C, Can. J. Phys. 83 (2005) 311. 58. Pelzl P J, King F W, Phys Rev, 57(1998)7268. 59. Ohrn Y and Nordling J, J. Chem. Phys. 39 (1963) 1864. 60. Li C, Wang L M, and Yan Z-C, Int. J. Quantum Chem. 113 (2013) 1307. 61. Li C, Wang L M, and Yan Z-C, Phys Rev A, 88 (2013) 052513. 62. Harris F E, Adv. Quantum Chem. 50 (2005) 61. 63. Quinn M J, Parallel Programming in C with MPI and OpenMP. (McGraw-Hill) 2003. 64. Sims J S and Hagstrom S A, J Chem Phys, 124 (2006) 094101. 65. Bubin S et al., Chem. Rev. 113 (2013) 36. 66. Wang L M, Yan Z-C, Qiao H X, Drake G W F, Phys Rev A, 83 (2011) 034503. 67. Wang L M, Yan Z-C, Qiao H X, Drake G W F, unpublished. 68. Wang L M, Li C, Yan Z-C, and Drake G W F, Phys. Rev. Lett. 113 (2014) 263007. 69. Wang L M, Li C, Yan Z-C, and Drake G W F, unpublished. 70. Golub G H and Van Loan C F, Matrix Computations. (The Johns Hopkins University Press, Baltimore, Fourth edition) 2013. 71. Faddeeva V N, Computational Methods of Linear Algebra. (Dover, New York) 1959, p81. 72. Chi X B, Math. Num. Sin. 15 (1993) 289 (in Chinese). 73. Dalgarno A, Lewis J T, Proc. R. Soc. London A 233 (1955) 70. 74. Puchalski M. Pachucki K, Phys Rev A, 78 (2008) 052511. 75. Puchalski M, Kedziera D, Pachucki K, Phys Rev A, 87 (2013) 032503. 76. Bylicki M and Pestka G, J. Phys. B 29 (1996) L353. 77. Kristensen P et al., Phys Rev A, 55 (1997) 978; Erratum Phys Rev A, 56 (1997) 1674. (b) Phys Rev A, 20 (1979) 378. 79. Drachman R J, J. Phys. B 14 (1981) 2733. 80. Pachucki K, Cencek W, Komasa J, J Chem Phys, 122(2005)184101. 82. Nortershauser W et al., Phys Rev A, 83 (2011) 012516. 83. Kabir P K and Salpeter E E, Phys Rev, 108(1957)1256. 84. Pachucki K, J. Phys. B 31 (1998) 5123. 85. Yan Z-C, Drake G W F, Phys. Rev. Lett. 91 (2003) 113004. 86. Drake G W F, Goldman S P, Can. J. Phys. 77 (1999) 835. 87. Pachucki K, Komasa J, Phys Rev A, 68 (2003) 042507. 88. Schwartz C, Phys. Rev. 123 (1961) 1700. 89. Yan Z-C, Nortershauser W, and Drake G W F, Phys. Rev. Lett. 100 (2008) 243002. Erratum Phys. Rev. Lett. 102 (2009) 249903. 90. Yan Z-C. Drake G W F, Phys Rev A, 66 (2002) 042504. 91. Sansonetti C J, Richou B, Engleman R (Jr), Radziemski L J, Phys Rev A, 52(1995)2682. 92. Sansonetti C J et al., Phys. Rev. Lett. 107 (2011) 023001. Erratum Phys. Rev. Lett. 109 (2012) 259901. 93. Brown R C et al., Phys Rev A, 87 (2013) 032504; Erratum Phys Rev A, 88 (2013) 069902. 94. Bushaw B A, Nortershauser W, Ewald G, Dax A, and Drake G W F, Phys. Rev. Lett. 91 (2003) 043004. 95. NIST Atomic Spectra Database: http://physics.nist.gov/asd3. 96. Nakamura T et al., Phys Rev A, 74 (2006) 052503. 97. Yan Z-C, Drake G W F, Phys. Rev. Lett, 79 (1997) 1646. 98. Puchalski M, Pachucki K, Phys Rev A, 79 (2009) 032510. 99. Brog K C, Eck T G, and Wieder H, Phys Rev, 153(1967)91. 100. Orth H, Ackermann H, Otten E W, Z. Phys. A 273 (1975) 221. 101. Noble G A, Schultz B E, Ming H, and van Wijngaarden W A, Phys Rev A, 74 (2006) 012502. 102. Walls J, Ashby R, Clarke J J, Lu B, and van Wijngaardena W A, Eur. Phys. J. D 22 (2003)159. 103. Das D and Natarajan V, Phys Rev A, 75 (2007) 052508; doi. 105. Drake G W F, in Long-Range Casimir Forces: Theory and Recent Experiments on Atomic Systems, edited by Levin F S, Micha D A. (Plenum, New York) 1993, p107. 106. Marin F, Minardi F, Pavone F, Inguscio M, Drake G W F, Z Phys D, 32(1995)285; doi. 107. Shiner D, Dixson R and Vedantham V, Phys. Rev. Lett, 74 (1995)3553; doi. 108. Wang L-B et al., Phys Rev Lett, 93 (2004) 142501. 109. Morton D C, Wu Q, Drake G W F, Phys Rev A, 73(2006)034502. 110. Mueller P et al., Phys Rev Lett, 99 (2007) 252501. 111. van Rooij R et al., Nature 333 (2011) 196. 113. Lu Z T et al., Rev. Mod. Phys. 85 (2013) 1383. 114. Puchalski M, Moro A M, Pachucki K, Phys. Rev. Lett. 97 (2006) 133001. 115. Ewald G et al., Phys. Rev. Lett. 93 (2004) 113002. Erratum Phys. Rev. Lett. 94 (2005 039901. 116. Sanchez R et al., Phys. Rev. Lett. 96 (2006) 033002. 117. Nortershauser W, et al., Phys. Rev. Lett. 102 (2009) 062503. 118. Nortershauser W, Ne T, Sanchez R, and Sick I, Phys. Rev. C 84 (2011) 024307. 119. Krieger A et al., Phys Rev Lett, 108 (2012) 142501. 120. Kato T, Perturbation Theory for Linear Operators. (Springer-Verlag, Berlin) 1980. 121. Simon B, J. Math. Phys. 41 (2000) 3523. 122. Reed M and Simon B, Methods of modern mathematical physics, IV: Analysis of operators. (Academic Press, New York) 1978. 123. Reed M and Simon B, Methods of modern mathematical physics, I: Functional analysis. (Academic Press, New York, Revised edition) 1980. 124. Kato T, Trans. Amer. Math. Soc. 70 (1951) 212. 125. Zhislin G M, Tr. Mosk. Mat. Obs. 9 (1960) 81. 126. Zhislin G M, Teor. Mat. Fiz. 7 (1971) 571. 127. Sigal I M, Commun. Math. Phys. 85 (1982) 309. 128. Reed M and Simon B, Methods of modern mathematical physics, II: Fourier Analysis, Self- Adjointness. (Academic Press, New York) 1975. 129. Maz'ya V and Shubin M, Ann. of Math. 162 (2005) 919. 130. Hill R N, Phys. Rev. Lett. 38 (1977) 643. 131. Brown G E and Ravenhall D G, Proc. Roy. Soc. (London) A 208 (1951) 552. 132. Zhislin G M, SIGMA 2 (2006) 024. 133. Morozov S, and Vugalter S, Ann. Henri Poincare 7 (2006) 661. 134. Matte O, Rev. Math. Phys. 22 (2010) 1. 135. Hardekopf G, Sucher J, Phys Rev A, 31 (1985) 2020. 136. Evans W D, Perry P, Siedentop H, Commun Math Phys, 178 (1996) 733. 137. Sucher J, Phys. Rev. A 22 (1980) 348. Phys Rev A, 23 (1981) 388. 138. Fierz M and Pauli W, Proc. Roy. Soc. (London) A 173 (1939) 211. 139. Bruneau L and Derezinski J, Rep. Math. Phys. 54 (2004) 169; doi. 140. Bach V, Fröhlich J, Sigal I M, Adv. in Math,137(1998)299; doi. 141. Bach V, Fröhlich J, Sigal I M, Commun Math Phys, 207 (1999)249-290. 142. Lieb E H, Loss M, Adv Theor Math Phys, 7(2003)667-710. 143. Klahn B, Bingel W A, Theoret Chim Acta (Berl), 44(1977)9-26. 144. Klahn B, Bingel W A, Theoret Chim Acta (Berl), 44 (1977)27-43. 146. Klahn B and Morgan III J D, J Chem Phys, 81 (1984) 410; doi. 147. Hill R N, J Chem Phys, 83 (1985) 1173; doi. 148. Drake G W F, in Handbook of Atomic, Molecular, and Optical Physics, edited by Drake G W F (Springer Science+Business Media, Inc.) (2006), p199. 149. James H M and Coolidge A S, J Chem Phys, 1 (1933) 825. 150. Drake G W F, Phys Rev A, 18 (1978) 820. 151. Myers C R, Umrigar C J, Sethna J P and Morgan III J D, Phys Rev A, 44 (1991) 5537. 152. Pack R T, Brown W B, J Chem Phys, 45 (1966) 556. (b) Kgl. Norske Videnskab. Selskabs Forh. 31(1958)138. (North Holland, Amsterdam). 1991, p641. 156. Feng K, Qin M, Symplectic geometric algorithms for Hamiltonian systems, (Zhejiang Publishing United Group, Zhejiang Science and Technology Publishing House, Hangzhou and Springer-Verlag Berlin, Heidelberg). 2010. 157. Klahn B, Bingel W A, Int J Quant Chem, 11(1977)943-957. The development of the optical frequency standard based on trapped and cold 40Ca+ with the 4s 2S1/2–3d 2D5/2 clock transition at 729 nm is reported. A single 40Ca+ ion is trapped and laser cooled in a ring Paul trap, and the storage time for the ion is more than one month. The linewidth of a 729 nm laser is reduced to about 1 Hz by locking to a super cavity for longer than one month uninterruptedly. In order to realize the frequency comparison, two similar 40Ca+ optical frequency standards are established. The overall systematic uncertainties of the clock transition of two 40Ca+ optical frequency standards are evaluated to be better than 6 × 10-17. With an over-one-month measurement, the frequency difference between the two clocks is measured to be 3.2 × 10−17 with a measurement uncertainty of 5.5 × 10−17, considering both the statistic (1.9 × 10−17) and the systematic (5.1 × 10−17) uncertainties. By the frequency comparison in three days uninterruptedly, a fractional stability of 7 × 10−17 in 20 000 s of averaging time is achieved. At the same time, the absolute frequency of the clock transition is measured at 10-15 level by using an optical frequency comb referenced to a Hydrogen maser which is calibrated to the SI second through the global positioning system (GPS). The frequency value is 411042129776401.7(1.1) Hz with the correction of the systematic shifts. Moreover, additional two precision measurements based on single trapped 40Ca+ ion are carried out. One is magic wavelengths for 4s 2S1/2-3d 2D5/2 clock transition, λ|mj|=1/2 = 395.7992(7) nm and λ|mj|=3/2 = 395.7990(7) nm are measured. It’s the first time that two magic wavelengths for the 40Ca+ clock-transition are reported. And the correlation between the magic wavelengths and the polarization direction of the linearly polarized laser is preliminary studied. The other one is the 3d 2D5/2 state lifetime measurement, our result of 1174(10) ms agrees well with the experimental results reported by P. A. Barton et al. [Phys. Rev. A 62, 032503 (2000)], A. Kreuter et al. [Phys. Rev. A 71, 032504 (2005)] and the recent RCC calculation result by B. K. Sahoo [Phys. Rev. A 91, 022511 (2015)]. Molecules have become an important resource for precisely measuring a number of fundamental physics quantities. This review provides an introduction to the properties of molecules that make them suitable for precision measurements, and surveys the state of the art in precision molecular physics experiments.© Anita Publications. All rights reserved. 1. Bloch Immanuel. Ultracold quantum gases in optical lattices, Nat Phys, 1(2005)23-30. 2. Georgescu I M, Ashhab S, Nori Franco, Quantum simulation, Rev Mod Phys, 86(2014)153-185. 4. H. S. Margolis. Optical frequency standards and clocks. Contemp. Phys., 51(1):37–58, 2010. 5. Andrew D Ludlow, Martin M Boyd, Jun Ye, E Peik, and P O Schmidt. Optical atomic clocks. Rev. Mod. Phys., 87:637–701, 2015. 6. B C Regan, Eugene D Commins, Christian J Schmidt, and DavidPhys. Rev. Lett., 88(7):71805, feb 2002. 7. C. S. Wood, S. C. Bennett, D. Cho, B. P. Masterson, J. L. Roberts, C. E. Tanner, and C. E. Wieman. Measurement of Parity Nonconservation and an Anapole Moment in Cesium. Science (80-. )., 275(5307):1759–1763, mar 1997. 8. Nicholas R. Hutzler, Hsin-I Lu, and John M. Doyle. The Buffer Gas Beam: An Intense, Cold, and Slow Source for Atoms and Molecules, Chem. molecules. Phys. Rev. Lett., 110(2013):143001, . CaF molecules. Phys. Rev. A, 89(5):053416, may 2014. 12. J. F. Barry, D. J. McCarron, E. B. Norrgard, M. H. Steinecker, and D. DeMille. Magneto-optical trapping of a diatomic molecule. 14. Cheng Chin, Rudolf Grimm, Paul Julienne, and Eite Tiesinga. Feshbach resonances in ultracold gases. Rev. Mod. Phys., 82(2010)1225-1286.
gas of heteronuclear molecules, Nat Phys, 4(2008)622-626. Their Absolute Ground State, Phys Rev Lett, 114(20):205302, may 2015. 20. Hendrick Bethlem, Giel Berden, and Gerard Meijer. Decelerating Neutral Dipolar Molecules, Phys Rev Lett, 83(1999)1558-1561.
time-varying electric fields. Phys. Rev. A, 65(5):1–20, may 2002. 22. Sebastiaan Y.T. van de Meerakker, Nicolas Vanhaecke, and Gerard Meijer. STARK DECELERATION AND TRAPPING OF OH RADICALS. Annu. Rev. Phys. Chem., 57(1):159–190, 2006. 24. Bucicov O, Nowak M, Jung S, Meijer G, Tiemann E, Lisdat C, Cold SO2 molecules by stark deceleration, Eur Phys J D, 46(2008)463-469. Michael Motsch, Gerhard Rempe, Sisyphus cooling of electrically trapped polyatomic molecules, Nature, 491(7425):570-573, nov 2012. Submillikelvin Temperatures. Phys Rev Lett, 116(2016)063005.
ngular-momentum orientation by multistage Zeeman deceleration. http://dx.doi.org/10.1080/00268976.2012.681312, 2012. 29. M. A. Chieda and E. E. Eyler. Prospects for rapid deceleration of small molecules by optical bichromatic forces. Phys. Rev. A - At. Mol. Opt. beams. Phys. Rev. A - At. Mol. Opt.Phys., 89(2):023425, feb 2014. 32. Rudolf Grimm, MatthiasWeidem? ?ller, and Yurii B. Ovchinnikov. Optical Dipole Traps for Neutral Atoms. Adv. At. Mol. Opt. Phys., 42(C):95–170, 2000. 33. DeMille D, Glenn D R, Petricka J, Microwave traps for cold polar molecules, Eur Phys J D, 31(2004)375-384. 34. Paul Wolfgang, Electromagnetic traps for charged and neutral particles, Rev Mod Phys, 62(1990)531-540. Klemens, Schmidt Piet O, Precision spectroscopy by photon-recoil signal amplification, Nat Commun, 5, jan 2014. 40. van Veldhoven Jacqueline, Bethlem Hendrick L, Meijer Gerard, ac Electric Trap for Ground-State Molecules, Phys Rev Lett, 94(2005)083001; doi:. At Mol Opt Phys, 74(2006)063403; doi:. Haak Henrik, Meijer Gerard, A linear AC trap for polar molecules in their ground state, J Phys Chem A, 111(2007)7411-7419.
polar molecules, Faraday Discuss, 142(0):37-56; discussion 93–111, 2009.
molecules at millikelvin temperatures, Nature, 395(6698)148-150. Phys Rev Lett, 100(2008)023003, . 53. Ho Paul T P, Townes Charles H , Interstellar Ammonia, Annu Rev Astron Astrophys, 21(1983)239-270. 57. Winnewisser G, Herbst E, Interstellar molecules, Reports Prog Phys, 56(1993)1209-1273, . 58. Herbst Eric, The chemistry of interstellar space, Chem Soc Rev, 30(2001)168-176. 63. Bagdonaite Julija, Jansen P, Henkel C, Bethlem H L, Menten K M, Ubachs W, A stringent limit on a drifting proton-339(6115)46-8, 2013.
proton-electron mass ratio using methanol lines. Mon. Not. R. Astron. Soc. Lett., 448(2015)L104-L108. 66. Commins Eugene D, Electric Dipole Moments of Leptons, Adv. At. Mol. Opt. Phys, 40(1999)1-55. 70. Hunter L R, Peck S K, Greenspon A S, Alam S Saad, De- Mille D, Prospects for laser cooling TlF, Phys Rev A, 85(2012)012511. 71. Isaev T A, Hoekstra S, Berger R, Laser-cooled RaF as a promising candidate to measure molecular parity violation, Phys Rev A 82(2010)052521. 72. Hinds Edward A, Sandars P G H, Electric dipole hyperfine structure of TIF, Phys Rev A, 21(1980)471-479.
as a candidate to search for parity and time-and-parityviolation effects, Phys Rev A, 90(2014)052513. 75. Hudson J J, Kara D M, Smallman I J, Sauer B E, Tarbutt M R, Hinds E A, Improved measurement of the shape of the electron, Nature, 473(2011)493-496. 86. Bouchiat Marie-Anne, Bouchiat Claude, Parity violation in atoms, Reports Prog Phys, 60(1999)1351-1396. H2 in Various Magnetic Fields, Phys Rev, 56(1939)728-743. 88. J. M. B. Kellogg, I. I. Rabi, N. F. Ramsey, and J. R. Zacharias. An Electrical Quadrupole Moment of the Deuteron. Phys Rev, 55(1939)318-319.